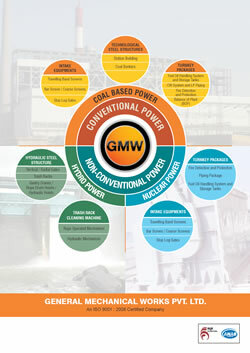 Executed over 75 power plant contracts, Coal, Gas & Nuclear based projects. Only Manufacturer of Hydraulic TRCM in India. Exporter of Trash Rack Cleaning Machines . Gates with Rope Drum Hoist for Barrage, Dam & Hydro Electric project. GMW started in 1978 with aim of turning imaginative, ideas & innovations into leading engineering products and services that maximize value for our clients. Our courage to diversify new products and continual improvement in these products is one of the reasons of our success. We provide well technical designs for dependable solutions. With timely completion & execution supported by good after sale services we are offering superior quality products & services to our customers. At GMW our mission is to offer customized solutions by integrating our vast knowledge, experience & skills with upcoming technical innovation to deliver products that maximize value for our clients. With our constant focus on customer satisfaction, service and timely execution of the product, we offer them superior technical product as per there desired requirement. We understand your problem and deliver solutions, professionally and on time.